You don’t want to start studying for the SAT too early and burn out long before exam day. You also don’t want to start too late and discover you need more work than you thought. So what is the perfect time frame? Keep in mind everyone is different. Everyone takes exams differently, remembers information differently and studies differently. However, taking into account some common factors every student faces, you can develop a plan and tweak it to fit your needs. The fall of your junior year is an ideal time to take your first SAT. This will allow you to take it again, if you need to, before you start your college applications during your senior year. The other advantage to taking the SAT in the fall of your junior year is that it gives you the summer to study. You should not sacrifice your grades to improve your SAT score. Both GPA and SAT scores are equally significant factors on your college applications. Studying during the summer allows you to focus on the SAT without worrying about other coursework. If you stick to this timeline, eight weeks is a good amount of time to allow for SAT prep. Take a practice test to find your baseline score. Depending on how much you want to improve, you can decide how many hours a week you need to study. A third of the way through your allotted study time take another full length practice test. If your score is improving on track, stick with your plan. If you need to improve significantly, plan more hours per week for studying. You may also want to include test prep assistance in your study plan. 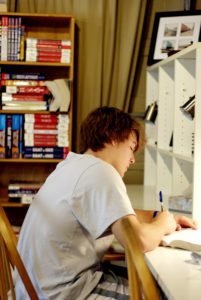 When you are planning to take the test during a spring semester, you may want to allow a longer period of time to study. Then, you will have more time for your coursework and your SAT test prep. Plan out when you will have big chunks of time to study during the year and take advantage of those opportunities. Remember, you have been preparing for the SAT as long as you have been in school. The exam covers curriculum you should know, just from being a student. Allowing yourself at least eight weeks to become familiar with the exam and review material should be sufficient to feel confident and perform well.